So many high school memories flooded back last night. Did I ever tell you I lettered in badminton in high school? I played freshman-junior year and it was so intense. Ha, not really, but it was a lot of fun. I don't know how I lettered, I think it was through some kind of default, because I honestly wasn't that good. And I doubt I even remember all of the rules anymore, but last night was so much fun. 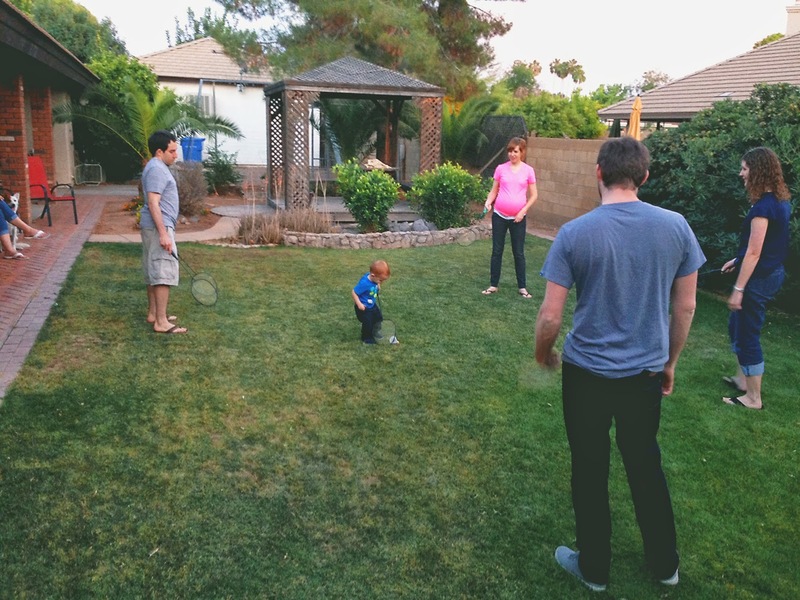 After dinner at my parent's house, we all headed outside to watch Fox play with the dog. Somehow, the badminton equipment emerged. 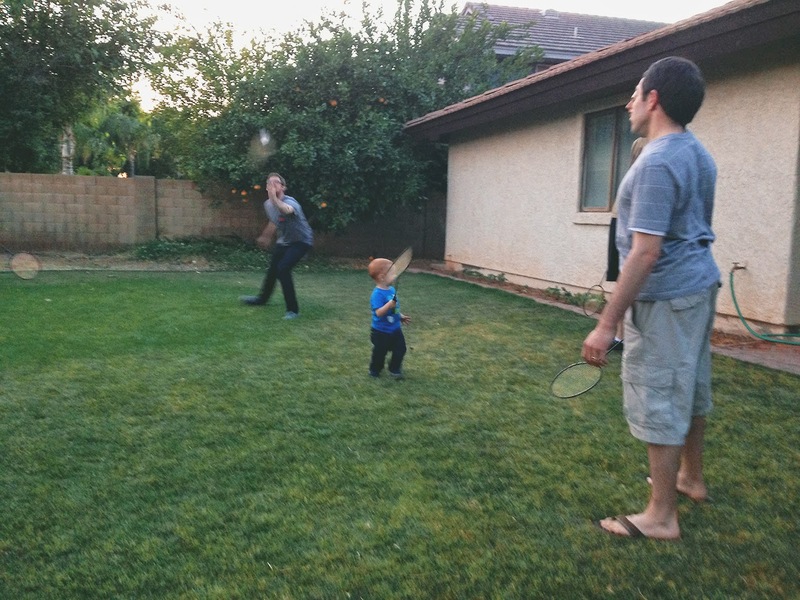 We didn't put up the net, we just hit it back and forth. The weather was perfect and it smelled wonderful outside. I was a little worried Fox would get tired of being the monkey in the middle, but he really didn't seem to mind at all. 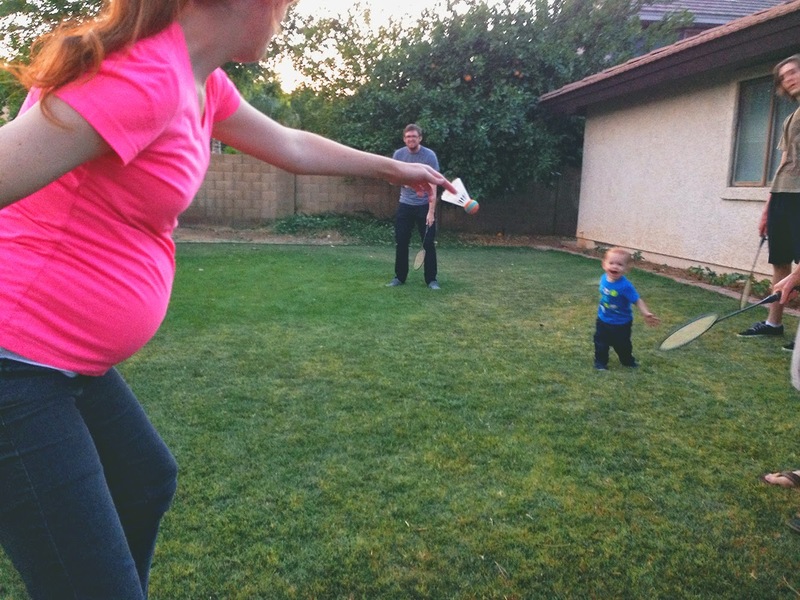 He just liked carrying around his racket and hit us a few times, and had a blast. The highlight of the evening wasn't captured on my phone, but it was glorious. Somehow, the birdie ended up in that huge bush behind Bethany in the above photo^^. I went to hit it out and ended up hitting it backwards over the wall:/ As we investigated though, it didn't go over the wall, so we knew it was in the bush somewhere. So flashlights emerged, somehow Tim ended up on the wall, people were crawling in the bush... After way too long, we finally found the birdie. 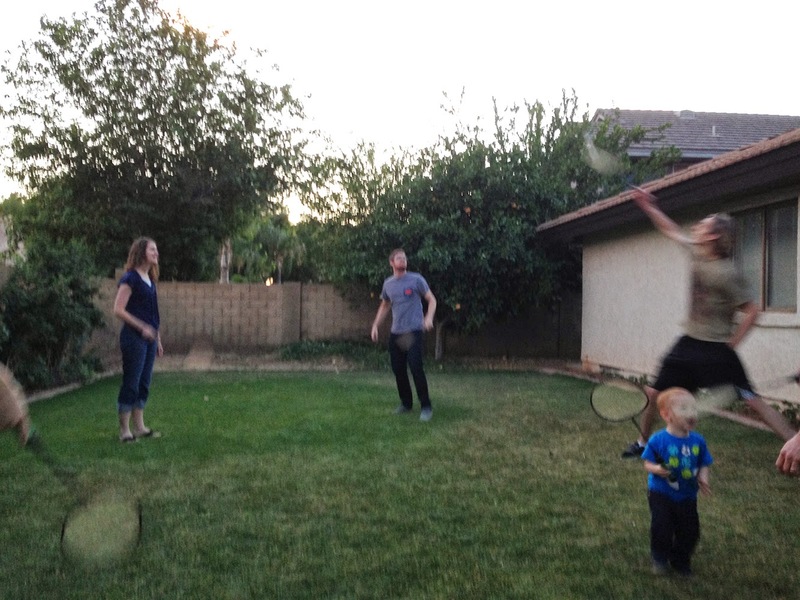 But as the last of the sunlight had disappeared, so had our badminton-playing ambitions. Maybe they'll be back next week? I'm thinking if this awesome weather continues, there's no way we'd pass up on it. p.s. this hot pink pregnant woman hits 33 weeks this week. Only 7 more to go! I dare say it was as much fun to watch as it was to play! And I imagine "lil peanut" was wondering what the heck was going on. BADMINTON IS AN ACTUAL HIGH SCHOOL TEAM SPORT?!?!?!?! !